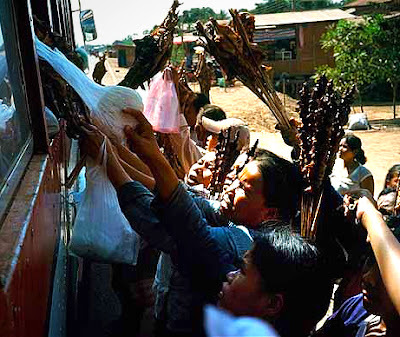 In 1999 I spent 2 months travelling from Muang Sing at the China-Laos border down to Don Det by the Cambodian border making my way along the entire length of Laos by bus and boat. By bus I mean something with a motor and wheels. 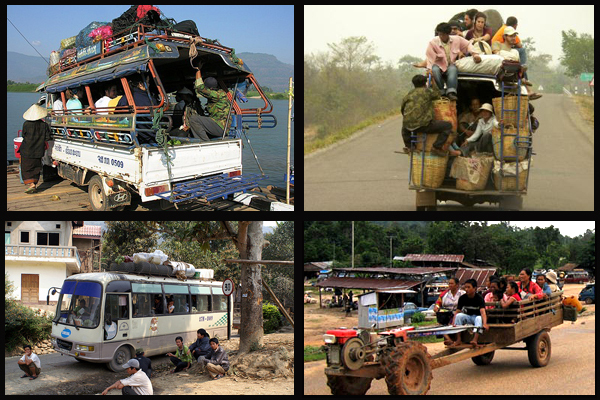 The number of different ways to get around Laos is incredible and one of the most memorable experiences one can have. Every time I meet someone who has been to Laos we eventually get to swapping horror stories about getting from one place to another. Our truck got stuck in a ditch trying to pass an elephant. The bus was so crammed with rice and textiles I couldn't feel my legs. The bus broke down and we had to wait in the middle of nowhere for 7 hours until a truck full of pineapples picked us up. there were live chickens tied together by the legs in the seat next to me. The stories go on and on. It is advisable to pick up a couple of khao jee pate sandwiches in a market before you leave as most of the time the only breaks you get are quick stops to put something on or off the vehicle at small towns and villages. 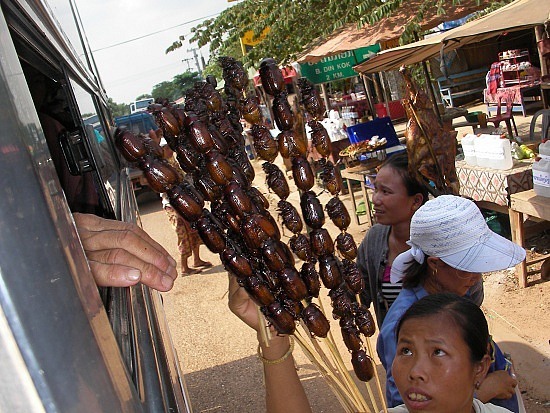 Usually the only food and drink you can get are sold by hawkers shoving their wares though the open windows of the bus. Something on a stick is the most popular choice with many options available. 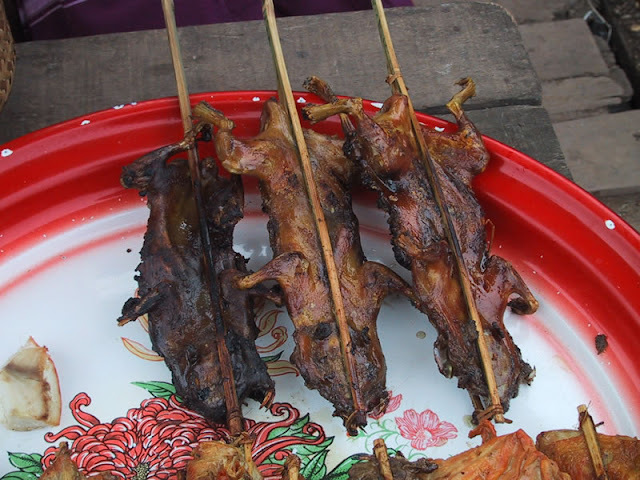 Roasted eggs, spicy cockroaches, chicken hearts, water rat, and the tasty and more familiar ping gai chicken. I've tasted them all, and other then getting cockroach wings stuck in my teeth, it was a pleasant experience. 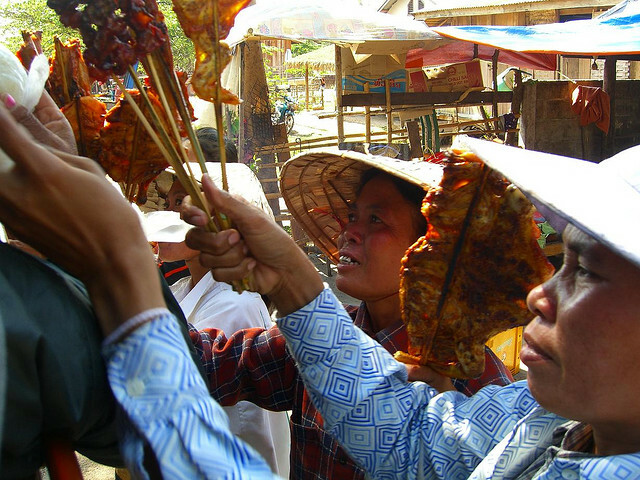 Ping gai is a flattened and marinated chicken piece skewered on bamboo and grilled. In Thailand it is called kai yang and is often sold by Isaan vendors street side with sticky rice and som tam, a spicy and salty green papaya salad. Isaan people come from the North East of Thailand bordering Laos and the Mekong river and have a similar rural lifestyle and culture to the Tai in Laos, the major ethnic group in the country. Urban migration has brought many people to cities like Bangkok and the Isaan food vendors have become familiar and popular to all Thais. Ping gai is a fairly simple dish with just a few ingredients, but the flavours are bold and delicious. Like som tam and many other street foods there is no specific measurements or recipes and one learns by doing. When I googled ping gai to see what other people's opinions were, I was pleasantly surprised to find The Queen Mother Cafe in Toronto to be a top source for recipes on the web. The Queen Mother/Rivoli was one of my first jobs out of George Brown in 1987. I had the pleasure of working with Noy Phongnanouvong, a great woman who has been cooking Laotian style food with some of her family at the Queen Mum and the Rivoli since 1978. I can therefore vouch for the recipe's authenticity and use it as the base for my own, which is slightly more elaborate with elements of the traditional dipping sauce jiao mak len incorporated into the marinade. Cut three chicken legs into drum and thigh and marinate in the following for a couple of hours. 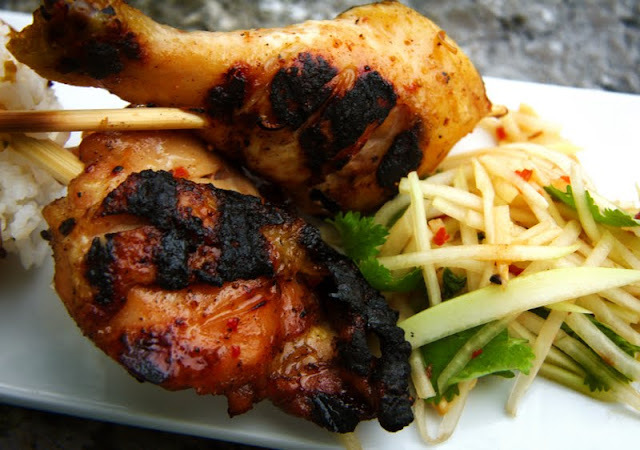 Soak 6 chopsticks in water while the chicken marinates, then skewer the chicken pieces and grill on a barbecue. 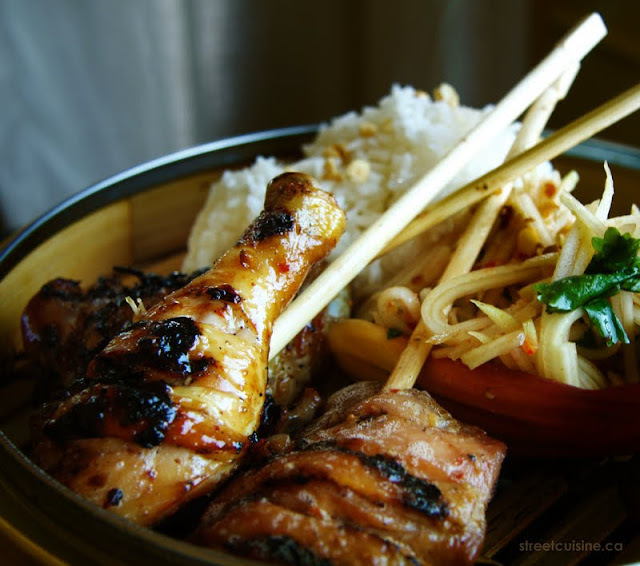 serve with som tam and sticky or jasmine rice. I made this for a friend's barbeque on returning from Laos to London for a few weeks...it was such a hit with everyone I made it again as part of a dinner party at my sister and her husband's new home. 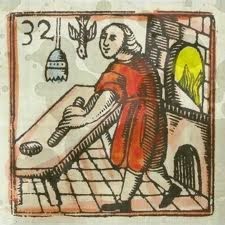 Even their friend (an accomplished chef), had seconds spooning the sauce and juices out of the bottom of the baking dish too! Beautiful photos! Delightful blog! I loved your recipe its authentic, sticky and amazingly addictive! I'm laotian by the way living in nz and this is how my aunt does her chicken!